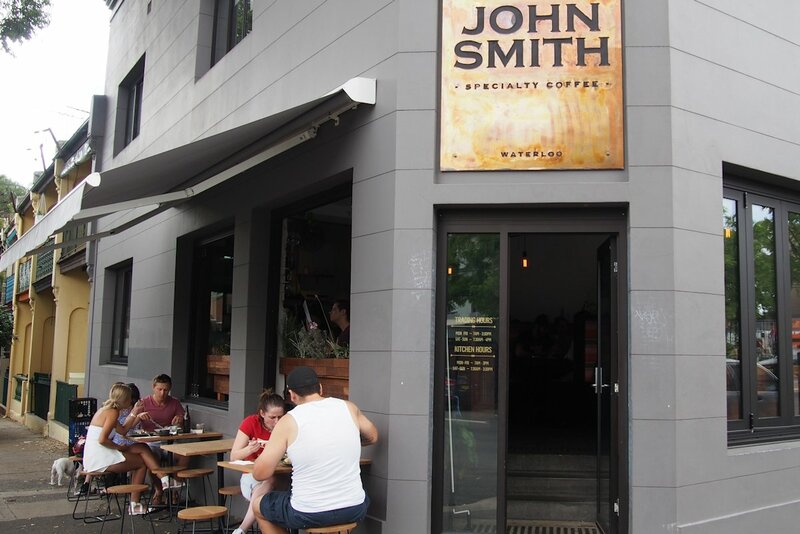 On a main road in the industrial-meets-residential part of Waterloo, John Smith Café has made a name for itself as the place for locals and breakfast aficionados to start their day. 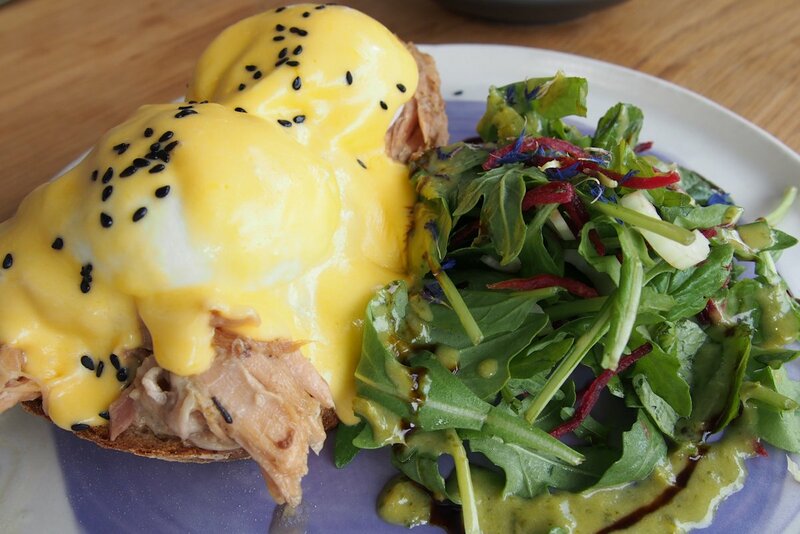 Founded by an experienced team, JSC produces some next-level dishes and coffee to die for. As long as you arrive before 10:30 you shouldn’t have an issue with seating as there is plenty both inside and out. Inside you’ll find a mix of tables and counter spots with a view. Service was quick and friendly and if you’re lucky enough you’ll be served by one of the knowledgeable and food-passionate owners. Quite often the fact that a café roasts its own beans can result in them shooting themselves in the foot as they try to bring too many services in-house but JSC has enough experience and produces one of the best cups ($3.50) I’ve tried in recent months. That’s saying a lot because I taste coffee from a lot of different roasters. 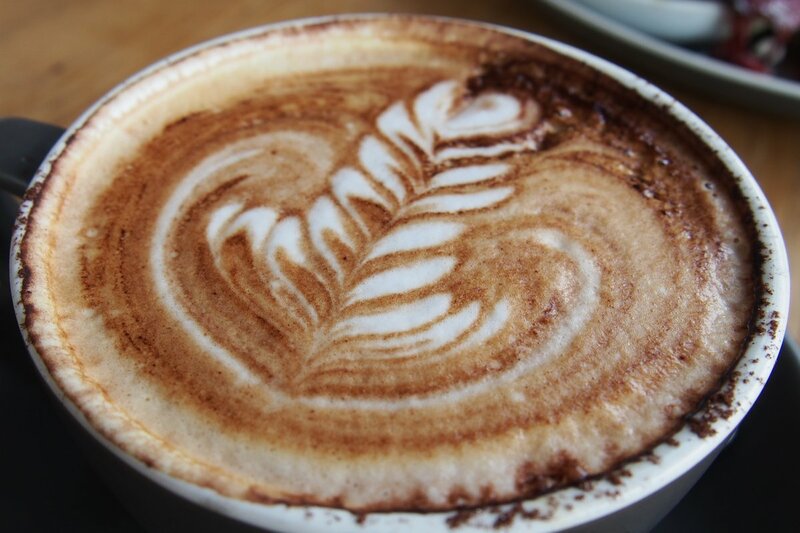 With strong, warming flavours from the beans, this establishment is bound to stay near the top of your list when you’re in need of caffeine. Tea ($4.50) is available in all the usual varieties as well as cold pressed juices ($7) such as green juice (cucumber, kale, pineapple, pear and lime) and watermelon with passionfruit and mint. You’ll find a few special items on the menu and they include smoked candy bacon, braised pulled pork and smoke cured trout. You can add them as sides so you can add a twist to pretty much every dish. 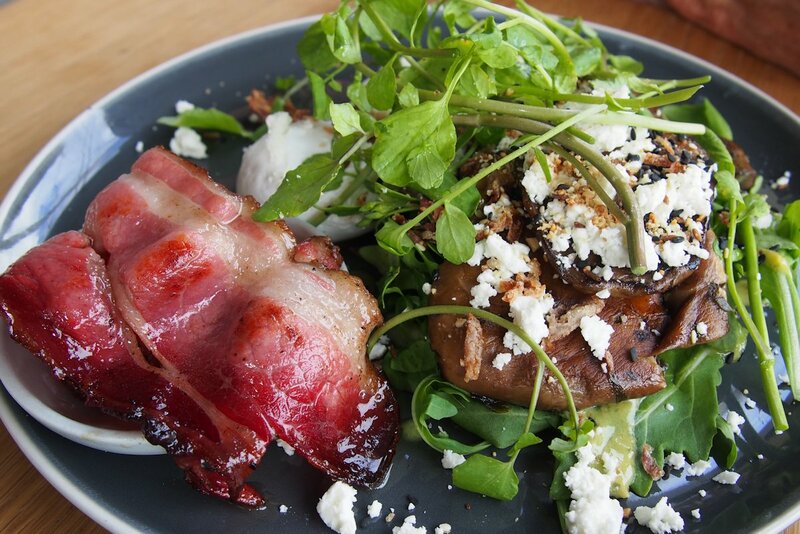 My guest chose the herb stuffed mushrooms ($13) with greens, goats cheese and beetroot hummus and she added a side of the smoked candy bacon for $5. The kitchen obviously knows it’s flavours and executed each item beautifully. They’re simple ingredients but when combined work so harmoniously, are prepared with care and seasoned so well. I ordered the eggs Benedict ($15) which is served with daily greens and a tangy, herby dressing on the side. The three additions that I’ve mentioned can all be added so I chose the braised pulled pork. The texture isn’t too hard to imagine; pork that falls apart at the touch of a fork yet I couldn’t help but think that I would have preffered it not to have been braised as a lot of the flavours dissipate into the water that it’s being cooked in. That said though, the eggs were poached perfectly and the thick hollandaise boasted a welcome tang. In hindsight, the bacon would make for a better match as would the trout but I was still very happy with the dish and its execution. I enjoyed my visit to JSC so much that I returned to find that the menu has already changed slightly. Don’t be disappointed though because what you’ll find are yet more cunningly put together dishes. 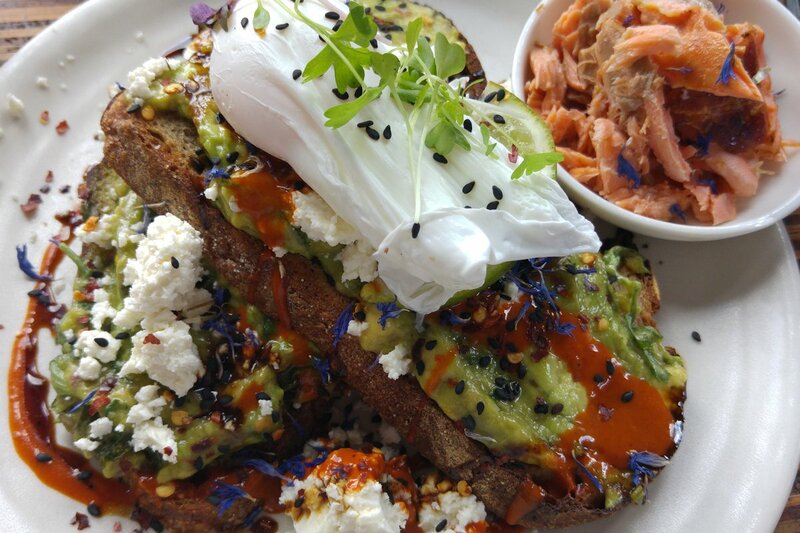 One of those dishes making a return is the avocado, sriracha and goats cheese on rye which is even more delicious than it sounds. Once again the seasoning and herbs lift the ingredients to another level. My guest would have liked to have seen a less sweeter chilli element, perhaps a habanero hot sauce but I was in heaven. There’s plenty more on offer such as the roasted Roma tomatoes and heirloom tomatoes with fresh herbs, fennel, pomegranate reduction, goats cheese on rye caraway sourdough ($16), the breakfast bowl (quinoa, daily greens, beetroot hummus, roasted roma tomatoes with a poached egg, $16) or house made toasted granola, berry compote with coconut yoghurt ($12). Lunch mainly consists of burgers, one of my other passions so I’ll be dropping in to sample those soon too! All-in-all you’ll be well taken care of in all respects at John Smith Café as it’s an establishment run by a team who know their individual crafts backwards! This entry was posted in Sydney - South and tagged Dog friendly, Outdoor seating, Parking close by. Bookmark the permalink.